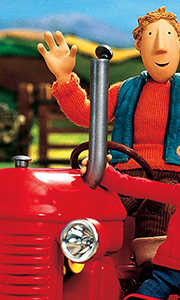 Meet Little Red Tractor and his owner Stan who live on the Gosling Farm, in Bobblebrook. Together with their friends including Big Blue, Harvey the Combine Harvester, Sparky the Pick-Up Truck, Nipper the Quad Bike, Mr Jones, Amy & Ryan, they always have lots of fun and exciting adventures. Our little hero maybe small, but he always saves the day, proving that 'you really don't have to be the biggest to be the best'. Join Little Red Trac.. It's summertime in Babblebrook and the weather is Hot Hot Hot! Stan and the kids are busy making everyone ice lollies, but can Little Red Tractor help with Stan's plan to keep their friends cool? Our little hero may be small but he always saves the day, proving that you really don'y have to be the biggest to be the best! Join Little Red Tractor, Stan and all their friends for 12 amazing adventures: Hot Hot Hot The New Engine Little Red.. Lets Go! : Meet Little Red Tractor and his owner Stan who live on Gosling Farm, in Babblebrook. Together with their friends including Big Blue, Harvey the Combine Harvester, Sparky the Pick-Up Truck, Nipper the Quad Bike, Mr. Jones, Amy & Ryan, they always have lots of fun and exciting adventures. Our little hero may be small, but he always save the day, proving that 'you really don't have to be the biggest to be the best'! Join Little R..
Own Little Red Tractor - Christmas Special DVD from Deff, DVD, Blu-Ray & 4K Video Specialists - Free UK Delivery..
Ryan and Amy are very excited because Stan has agreed to help them dress Little Red Tractor up as a dragon for the final procession of the annual Babblebrook Fair. Meanwhile Mr. Jones refuses to enter into the spirit of things; he thinks that fairs are very tacky and as for all this talk about dragons, what nonsense! With some fancy painting from Stumpy, Little Red Tractor makes a very convincing dragon and Mr. Jones is in for a surpris..
Own Little Red Tractor - Topsy Turvy DVD from Deff, DVD, Blu-Ray & 4K Video Specialists - Free UK Delivery..
Little Red Tractor - Winter Lights: In 'Winter Lights' it's Christmas time in Babblebrook and everyone is really looking forward to the Christmas lights being turned on. When everything dosen't go to plan, Little Red Tractor and Stan decide to stage ther own festive light display! Plus 5 more funfilled episodes. Little Red Tractor - Glorious Mud: Mr. Jones and Big Blue have allowed Stan's pigs to escape to the Marshy Wood... they're su..